(Phys.org) —Lockheed Martin has announced that it intends to build a new kind of extraction and payload delivery craft that can be flown remotely or at times autonomously. The craft is to resemble a helicopter, but will use tilting ducted fans instead of rotors—Lockheed says it will be safer to fly and will allow for landing in a smaller zone. The Transformer TX reportedly began as another attempt to build a flying car. But, as engineering designs were proposed, it became clear that simply allowing a car to be flown would limit the flexibility of the craft. The most recent design calls for a pod-carrying ability, which could at some point include a car or other ground based vehicle. Helicopters have been used in warfare for years—images of Huey helicopters extracting soldiers from battle sites in Vietnam come to mind. But helicopters, despite the skill of the best pilots, are still difficult to fly. Also, whenever extractions are executed or supplies delivered, there is always the chance of enemy fire bringing the craft down. For that reason, DARPA has been doling out contracts looking for a better way to do both. The Transformer TX appears likely to be that vehicle. Lockheed, courtesy of its world famous Skunk Works engineering team, will be designing and building the craft along with Piasacki Aircraft—they report that they expect flight tests to begin as early as 2015. Once complete, the craft is expected to travel at 200 knots with a 250-mile range. The finished design will rely on a pod-carrying facility that allows for assisted loading and autonomous unloading. 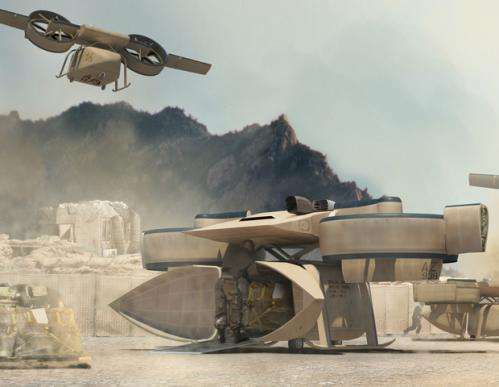 The idea is that a military unit could load whatever is needed in the pod and have it delivered quickly and safely to a war zone. Of course, the craft could be used in reverse as well, carrying cargo or people out and away from the action to a predetermined location. In addition to payload delivery and extraction, Lockheed expects the craft to be used for reconnaissance missions and at some point and as a vehicle with a strike capability, as well. Second panel - shades of the vehicles in Avatar! IMHO, that's the future of rotary-wing aircraft - small and large versions. Twin ducted fans eliminate the need for a tail rotor and the tilt capability provides greater flexibility and mobility. Amazing it has taken so long to decide to build these. 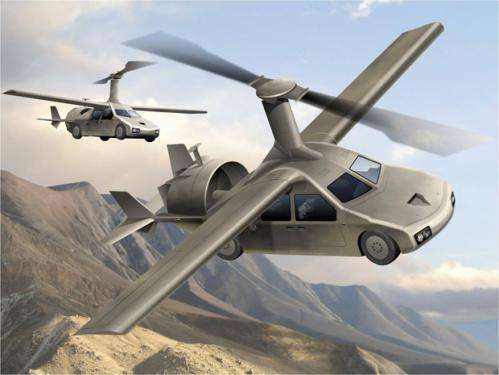 All of these concepts based on flying cars or tilting ducted fans end up to have barely enough power, being incredible noise machines and extremely inefficient for long distances. I wish them all the luck but history shows this is never a big success. The difference between RC drones and large manned vehicles are incredible. The European PROJECT ZERO is one of the only once that comes close. But again it has very little room for cargo and the battery technology is not powerful enough for reasonable distances for at least a decade to come. To put a relatively heavy military vehicle underneath is even more crazy. But if the military pays for concepts and demonstration vehicles then that is what Lockheed will provide. The evolution of the SUV & Mini Van. Flying soccer moms! Imagine the day when a bunch of these things fly into a battle to release smaller combat drones, all the while larger predators are flying overhead. Combined with cruise missile strikes to secure landing zones this sounds like a bad day for the enemy!! Though no doubt the arms race will create counter measures. The future of warfare lies in the hands of robots, AI and 'humans in the loop' remote technology. I hope we are on the RIGHT side when this happens, and that the people of the nations involved can refrain from total human obliteration. What a clever species we are. We advance ourselves, just to create ever smarter ways of killing ourselves!! Future warfare may well resemble an attack by aliens. Hang on for a sec, did I just describe the movie TERMINATOR in my above post?? The limiting factor has always been the material for the fan itself. With such a small diameter, you've gotta greatly increase the loading on the blades. You do this by increasing their surface area, increased blade pitch, and increased RPM's. You can't tell anything from the artist's concept drawings. The working designs could be quite different than what they're showing. I wouldn't be surprised to see variable pitch rotors in the fans. That's way more efficient than speeding up and slowing down the fans, as well as giving you quicker response time on the controls. Another advantage of variable pitch fan blades is that you can zero them when you land and then you don't get prop wash, which tends to help prevent junk getting kicked up into the air and back down into your fan blades, as well as making it easier for people to work near it. So youre saying that, while this appears to be a superior design, there will never be an adequate power source for it? Thats a little naive isnt it? I suppose people were saying this about airplanes and horseless carriages right before internal combustion was invented. But tilt rotors should give way to tiltjets.